There’s nothing better than having your own swimming pool, especially on a hot summer’s day when your friends and family are chilling out. But how about keeping that oversized water feature nice and clean all year round? Okay, it may not be rocket science but it definitely needs a little TLC on a regular basis. Apart from hiring a pool guy or gal, you could look at your favourite handheld device to lend a hand. Did you know that there are a myriad of Smartphone Apps that have been developed to set up and maintain your pool, and they seem to be doing pretty well. We’ve grabbed a few of the best models here and offer an unbiased review on them just for you and your pool – Enjoy! Our first pool friendly Smartphone App is an Android offering that is totally free and certainly has a lot of fans already. Most pool owners know about the importance of testing and balancing the pool water. But it can be a little challenging when the results are less than clear. The developers provide a bespoke set of testing strips that work in conjunction with the App and make things a lot easier for you. Once you have dipped the strip into the pool you can take a snap of the watery result and let your Insta LINK application go to work. You can log into the main website for some very clever post-analysis and once you have the results you can start remedying the issues, if there are any. Speak to the onboard experts for some bespoke advice that should return your pool back to its wonderful self. You can even link to your local dealer for some professional aftercare. You’ll also need to get a SmartScan card to run your pH/Alkaline test but they will last ages and cost very little. You’ll also be able to store your results and can compare them a month or a year later. This App will run on your iPhone, iPad and iPod Touch and will require iOS 5.1 or later for smooth running. The Pool Doctor is all about helping you to keep your pool nice and healthy and does a pretty good job of it in our opinion. 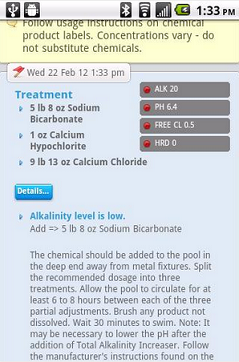 You’ll need your own pool care kit, simply use it as normal and dial in the results to the iOS App. 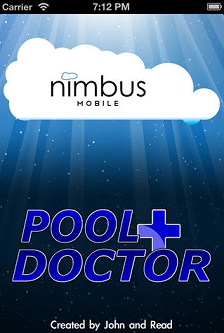 Once the details are on board, the Pool Doctor can start to do its stuff. You’ll get the correct advice on how to achieve that perfect balance and you can save the results if you wish. You may need a little experience before using this App but it is intuitive enough to learn after a few tries. It also contains a shock calculator that allows you to totally cleanse your pool after a nasty storm or a winter break. To Cool For Your Pool? Both of these Apps are very helpful and we’d suggest that novice pool owners go for the first one, plus it is absolutely free! The author of this article, Abbey Brooks, is a project supervisor at OpenAire, a company well-known for their contemporary water park designs. A nature lover, she participates in activities like planting trees and is a big proponent of recycling programs.